Several parishes around the country have created displays and regular messages in parish newsletters, to help promote the ‘spirituality and good works’ of Suzanne Aubert. At St Josephs in Ohakune you will see a wonderful display. To receive regular reflections from Suzanne Aubert, sign up at www.suzanneaubert.com and please pray for her beatification. 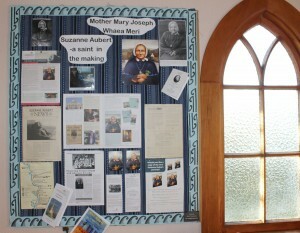 We love to see examples of Church and school displays that feature Venerable Suzanne Aubert. If you can send a photo of the display in your parish church, we will put it here for everyone to see.